The Afghan national flag is raised during a ceremony in Marjah, Afghanistan, on Thursday. 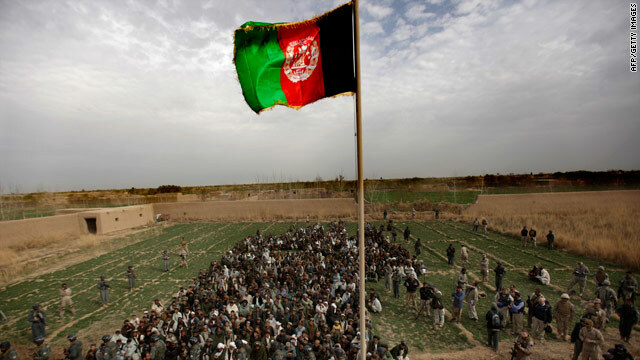 Marjah, Afghanistan (CNN) -- Authorities raised the Afghan flag over the battle-scarred enclave of Marjah on Thursday, a ceremony symbolizing the presence of the Afghan government in the Taliban stronghold. The red, black and green banner was hoisted over an area where U.S. and other troops have been fighting the Taliban in Operation Moshtarak -- the biggest offensive of the war. A few hundred people watched the event, attended by Helmand Gov. Gulab Mangal, other provincial and local officials, and military officials. "I think we're feeling pretty good about the control of the populated areas, the infrastructure," said Brig. Gen. Larry Nicholson, commander of U.S. Marines in southern Afghanistan. About 15,000 NATO-led and Afghan forces hope to oust the Taliban and restore Afghan government control to the region in the southern Afghan province of Helmand. They are working to persuade citizens to turn their allegiance away from the militants and toward the Afghan government. Viewing the ceremony with hope, curiosity and skepticism, one local in the crowd said he doesn't trust the Afghan government or its security forces. Asked if he thought change will come, Abdul Qader accused the Afghan government of corruption. "If the foreigners do it, things will change. If the Afghans are in charge, there is no way." Another citizen, Mohammad Sardar, said the Taliban brought the people security, but not proper services such as schools and roads. He said that while he still fears foreign forces, he hopes they can bring about change. Qader said the foreigners won't be able to get rid of the Taliban completely, but the militants "will put their heads down and fade away on the condition that help is brought, roads are built and security is achieved." The event took place as NATO's International Security Assistance Force reported trends that show security is improving and signs of stability are emerging in the region. The offensive has been under way for 13 days and is expected to continue for at least another two to three weeks. Nicholson said there is still "some fighting to do -- potentially in some areas that we haven't gotten into." ISAF said in a news release Thursday that security is improving and signs of stability have been emerging despite "occasional" clashes between militants and soldiers. Haji Zahir, deputy district governor of Nad Ali, told 200 people in Marjah at a shura, or community council, that security conditions have improved and that more Afghan National Police were to be posted there, ISAF said. He "promised to ensure the opening of shops and clinics, and personally oversaw the distribution of rice, beans, cooking oil and sugar to the gathering." The NATO-led command said new shops have opened at Marjah bazaars, with telephones, computers and other electronics available. It said there has been a "significant increase in the number of local residents returning to the area" and "a decrease in the number of residents registering as internally displaced persons."